Never mind the status quo—or the troubled past. Though Republicans have dominated politics in the Town of Oyster Bay for decades, Supervisor Joseph Saladino touted the GOP as the party of change and the future. The town’s Republican Committee officially began its 2017 campaign season on June 3 in conjunction with opening its headquarters on South Broadway in Hicksville. 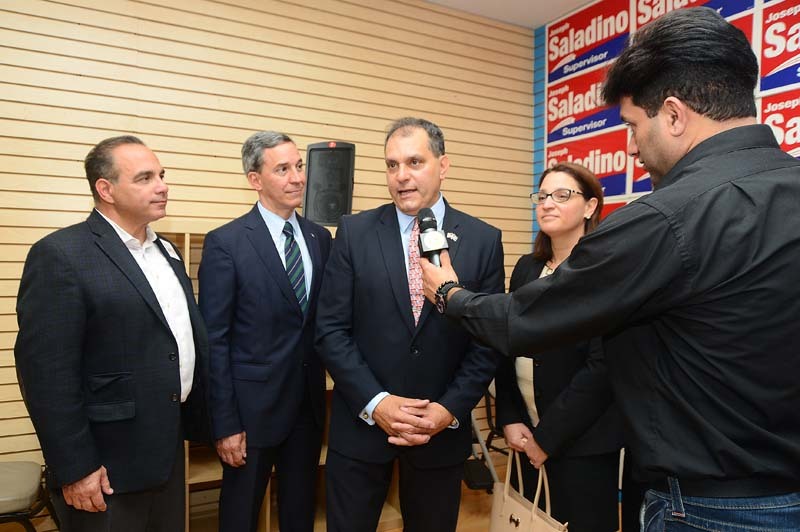 The large first floor retail/office space was packed with officials, candidates and supporters as Saladino rallied the troops, touted his team’s qualifications and record, and blasted the Democratic opposition. In January, Saladino succeeded the town’s longtime leader, John Venditto, who stepped down to prepare his defense against federal corruption charges. Venditto’s term was to have ended on Dec. 31, and so Saladino will have to run this November to win a mandate on his own. Also on the ballot will be councilmembers Michelle Johnson, seeking her third term; Lou Imbroto, who replaced Joseph Pinto in March (Pinto stepped down to become parks commissioner); and Thomas Hand, who replaced Chris Coschignano last month. James Altadonna Jr. will seek another term as town clerk. Also on hand were Jack Martins, Steve Labriola and Maureen O’Connell, running respectively for county executive, comptroller and clerk. Martins was tapped by the county GOP instead of two-term incumbent Ed Mangano, who is facing federal corruption charges and has not indicated if he will enter the race. Labriola is seeking to replace George Maragos, Republican turned Democrat, who is retiring. O’Connell is the incumbent. Saladino also mentioned the support the ticket would be getting from the Conservative, Independent, Reform and Tax Revolt parties. He took aim at what he considered the Democrats’ focus on past misdeeds that have seen a cloud of suspicion hang over the town. Other speakers also made note of the opposition’s campaign strategy. Martins promised that the county and town’s best days were ahead. The ensuing response made it clear that the people in the room were confident that the Republican dominance of Oyster Bay would continue. Saladino pointed to a May 31 decision by a federal judge dismissing the first of three lawsuits brought by a creditor seeking what it claims were loan guarantees made by the town for moneys lent to a former concessionaire of the town golf course and one of its beaches. The decision essentially said that the town was not liable for these loan guarantees because the town board never approved them and further, they violated the state constitution. “The results of this case prove beyond a shadow of the doubt that the Democrats are wrong,” to accuse the present town leadership of being tied to the corruption of the past, according to Saladino. “The taxpayers deserve a government that serves the public, not one that has a history of working with John Venditto and treating politics like their personal piggy banks,” said board candidate Bob Freier. “Town of Oyster Bay residents are smart enough see right through this administration’s fake reforms and know that Joe Saladino, right-hand man to John Venditto, can’t be trusted,” said board candidate Eva Pearson.